Make yourself at home in the capital city of Kansas. Topeka offers a variety of lodging experiences, from charming bed and breakfast properties to franchise favorites. For those who crave the outdoors, Topeka is home to several RV Parks and the Lake Shawnee campground. No matter what your budget or accommodation criteria, there&apos;s something for everyone in Topeka. Everything is conveniently located throughout the city, just minutes from major Topeka attractions and historic sites, as well as great shopping, dining and nightlife options. 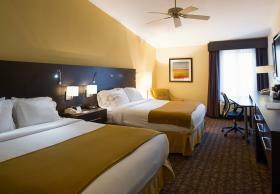 Your perfect Topeka getaway is just a click away!